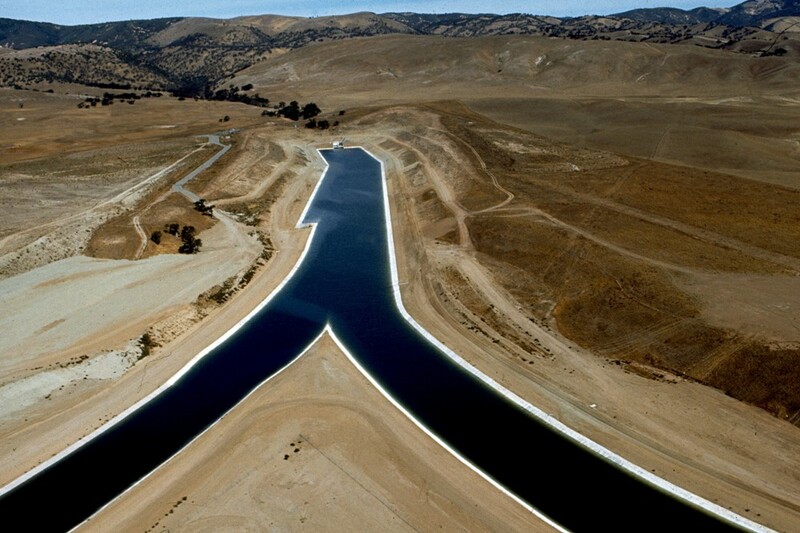 The California Aqueduct moves water hundreds of kilometers from the state’s north to its south. Water also moves nearly 610 meters (2,000 feet) over the Tehachapi Mountains into the Los Angeles Basin, a water-delivery system that consumes heaps of energy. California’s biggest city wants to use less imported water and develop more local supplies. Click image to enlarge. Two discussions that play a large role in the future of California’s water systems begin this week. Today, the California Water Commission, a nine-member body appointed by the governor, will begin piecing together the rulebook for a water-infrastructure spending spree. In November, voters approved a $US 7.5 billion bond that allocates $US 2.7 billion to “water storage” projects. The commission is charged with selecting the projects that will receive state funds. Applicants will include new reservoirs, underground storage, and proposals to clean up dirty aquifers. Then on Thursday, the Los Angeles Department of Water and Power (LADWP) will hold the first of two public meetings to unveil a multi-decade plan for turning the region’s rain storms into a water asset. The Stormwater Capture Master Plan will outline ways to retain the rain rather than channeling it out to sea. The goal is to create local sources of water for the department’s 4 million customers and reduce the need for water that is imported — an energy-intensive and expensive source that is unreliable in dry years — from northern California. The two meetings are the highest profile examples of discussions that are taking place in California communities, both large and small. The state’s enveloping drought, now in its fourth year and showing no signs of relenting, has accelerated a long-coming reckoning: that the state’s current water system — its network of canals that stretches hundreds of kilometers from north to south, east to west, and its local plumbing — is not appropriate for changing climate conditions. New construction is happening at every turn of the road, every bend of the coast. San Diego will open the largest desalination plant in the Western Hemisphere this fall, a $US 1 billion investment. Just to the north, Solana Beach, a community of 13,000, recently cut the ribbon on a $US 5 million stormwater project. Orange County Water District — lauded worldwide for its innovative partnership to cleanse and reuse wastewater — has entered into negotiations for a desalination facility in Huntington Beach. Meanwhile, Los Angeles is ridding aquifers of a legacy of industrial contamination so that more water can be held underground. The California Water Commission’s task is complex. It must evaluate a slew of water-storage proposals and then dole out $US 2.7 billion to projects that meet a set of criteria that were outlined in the legislation that authorized the water bond. Selected projects must provide a public benefit, improve water quality and water flows in the imperiled Sacramento-San Joaquin Delta, and, quite literally, hold water. Half of the public benefits for each project must be “ecosystem benefits.” All of these terms must be defined and ranked, and the commission has a December 15, 2016, deadline for developing its scorecard. Construction timelines depend on the projects that are selected. The biggest debate will be over dams and reservoirs. Four such projects — Sites Reservoir to the north of the Sacramento-San Joaquin Delta; Temperance Flat Dam, east of Fresno; an expansion of Los Vaqueros Reservoir, south of the delta; and storage within the delta itself — are eligible for funds. Opponents argue that the reservoirs will provide little reliable water at a steep environmental cost. A recent study supports their economic argument. A Stanford University analysis found that, for the same cost, groundwater basins could store six times the water as surface reservoirs. Los Angeles is pursuing its own version of storage. The goal of capturing more stormwater is part of a multifaceted approach to diversifying the city’s water supply by increasing recycling, conservation, and groundwater use. In October, Mayor Eric Garcetti issued an executive order that requires LADWP to cut its purchase of imported water in half by 2024. Stormwater only accounts for a fraction of the city’s current water use, but the water department wants to increase stormwater’s share to 4 percent by 2035. The draft plan that will be unveiled Thursday will recommend a mixture of centralized basins that can absorb a large flush, as well as smaller, decentralized options such as home rain barrels and neighborhood rain gardens. Achieving the goal will take some upfront investment, but reducing the amount of water that is pumped nearly 610 meters (2,000 feet) over the Tehachapi Mountains and into the Los Angeles Basin will eventually cut costs. “If we can minimize imports, it’s going to be much better for ratepayers and cheaper for us,” Albert Rodriguez, Los Angeles Department of Water and Power spokesman, told Circle of Blue. It is rather obvious the Los Angeles area is too big for the intended supply of the California and Colorado River projects. Over the many years population and buildings have increased by large amounts, commercial use of water, residential landscape irrigation and so forth puts added demand for large amounts of imported water which is likely, exceeding the original maximum supply engineered by the two sources of water. However, there’s also another factor that has come along since both projects were born, the sale of water via water contracts to various buyers who were never intended by the original design. Too much demand and selling for profit plays a big role in how much water is really needed vs. what is being used/sold. Drilling for well water would be a good idea especially since much of the surrounding counties are sitting over rivers of underground water supply.